Greetings again from the darkness. It’s referred to (sometimes affectionately, sometimes not) as Wes World. Many directors have their own style, though few are as immediately recognizable as a film by Wes Anderson. 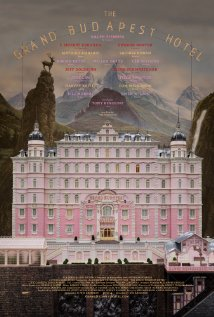 THE GRAND BUDAPEST HOTEL, MOONRISE KINGDOM, FANTASTIC MR FOX, THE ROYAL TENNEBAUMS, and RUSHMORE all share a tone and style … a cinematic personality, if you will, that places them squarely in Wes World. Beyond the similarities, there is also a level of innovation and creativity in each of his projects. He consistently delivers a “Wow” factor, or in the case of his latest, a “bow-wow” factor (my one and only pun, I promise). Expanding on the stop-action animation he used in FANTASTIC MR. FOX, director Anderson also plays homage to Japanese filmmaking – especially the animation of Hayao Miyazaki and the cinematic legend Akira Kurosawa. 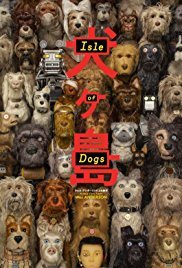 The film’s prologue, “The Boy Samurai” is a Japanese fable and sets the stage for a futuristic Japan where the Mayor of Megasaki, Kobayashi (voiced by Kunichi Nomura), has decreed that all dogs should be banned from society due to dog flu, snout fever and canine saturation. Kobayashi (an embittered politician who looks eerily similar to Japanese acting legend Toshiro Mifune) even ships off his nephew’s beloved Spots (Liev Schreiber) to Trash Island. In Part 1 “The Little Pilot”, that nephew, Atari (Koyu Rankin) crash lands his plane on Trash Island while attempting to rescue Spots. Part 2 (“The Search for Spots”), Part 3 (“The Rendez-Vous”), and Part 4 (“Atari’s Lantern”) break the story into segments, but the real fun here is in the visual effects and the banter amongst the dogs. The five main dogs we follow are Chief (Bryan Cranston), Rex (Edward Norton), Boss (Bill Murray), King (Bob Balaban), and Duke (Jeff Goldblum). Chief is a stray dog who is the group skeptic and doesn’t hesitate in greeting most anyone with “I bite”. We know this because director Anderson explains “Barks are rendered in English”. While assisting Atari with his search, the five dogs alternate between gossiping and decision-making by committee … spouting one-liners that are consistently funny and incisive. Anderson co-wrote the script with Roman Coppola and his frequent collaborator Jason Schwartzman. Kunichi Nomura provided expertise to ensure the Japanese segments were accurately portrayed. The usual Wes-style droll humor is evident throughout, though viewers must make sure their hearing is fined tuned to catch some of the wise-cracks that almost seem like background noise at times. In addition to the humor, political corruption and conspiracies are at the core of what could be described as an animated rescue adventure comedy. Narrator Courtney B Vance ensures we are following along with the story, although the artistic beauty of Trash Island – a garbage strewn wasteland – is enough to hold our interest. Keeping track of the homages is challenging enough, but we also get Haikus, Puppy Snaps, and Yoko Ono as a scientist. 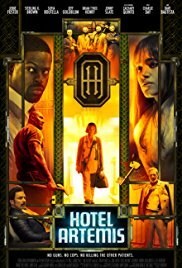 Greta Gerwig voices Tracy, an idealistic Foreign Exchange student who recognizes a corrupt politician when she sees one, and there are a couple of brilliant noirish scenes between Chief and Nutmeg (Scarlett Johansson). A recurring visual of dogfights in a cloud of dust harken back to the days of classic cartoons and the unbridled violence that we’ve always found so comical in animation. It’s a dystopian tale … well it is if you happen to be a dog. Cat lovers probably view this as paradise. An all-star cast of voice actors keeps us interested even when the story bogs down at times, although the look of the film always seems to be priority one. It’s such an easy movie to respect, however, one that’s a bit more difficult to speak passionately about. This review doesn’t address the ever-present complaints from those looking to create a race or nationality based scandal. To me, the film is creative and appears to be against unkindness and discrimination and corruption. Perhaps that message overrides some easily ruffled feathers. Greetings again from the darkness. The ultimate cinematic dilemma … how to make the next comic book movie stand out from the (many, many) others? The brilliant answer comes from director Taika Waititi and co-writers Eric Pearson, Craig Kyle and Christopher Yost – a screwball superhero action film that delivers not only the required alien war scenes, but also a campy villain for the ages in a movie that may be the funniest of the year. For those who prefer their superheroes dark and brooding, this one will be a shock. Prepare for Jeff Goldblum as the Grandmaster – the most polite villain we’ve seen in awhile, and one who looks to be straight out of the 1960’s “Batman” series. Chris Hemsworth as Thor is one of many returning actors/characters, only this time he really gets to flash his comic timing on top of his Thunder God biceps. His love-hate, trust-no trust, see-saw relationship with brother Loki (Tom Hiddleston) is in full force, as is the Bruce Banner banter with The Hulk (Mark Ruffalo). It’s certainly more in line with GUARDIANS OF THE GALAXY than the previous movies for Avengers. As much fun as Goldblum brings to the party, this is really Cate Blanchett’s show. She is the frightening (with a dash of camp) Goddess of Death, and long-lost sister of Thor and Loki, and daughter of Odin (Anthony Hopkins). With a headdress that puts everyone at the Kentucky Derby to shame, Hela’s enormous powers are such that she crumbles Thor’s mighty hammer with little effort – just to remind everyone that big sisters are renowned for messing up younger brother’s toys. In addition to the main rescue story line, the powerful villains, and crazy aliens, there are numerous nods and tributes to previous versions (notably Planet Hulk, and Fantastic Four), and a hilarious early stage play with three cameos that make it clear, big time laughter is here to stay. It’s fun to catch the reunions from such previous projects as Star Trek, JURASSIC PARK and Westworld. Special acknowledgment goes to director Taika Waititi for hilariously taking the comic book film world down a different path. He’s known for his comedic projects like HUNT FOR THE WILDERPEOPLE (one of my favs from 2016), WHAT WE DO IN THE SHADOWS, and his work on the brilliant but short-lived “Flight of the Conchords”. It’s still very much a Marvel movie, with visible fingerprints of Stan Lee, Larry Lieber, and Jack Kirby. 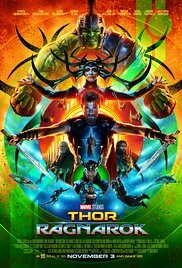 It’s also a fantastic adventure film that sets the stage for next year’s AVENGERS: INFINITY WAR, while also featuring the best use ever of Led Zeppelin’s “Immigrant Song”. So get ready to rock, roll and rollick in a film that is just about as much fun as you can have in a theatre. There are a few truly awe-inspiring moments in movie history. One of the most memorable occurs when Dorothy steps out of her Black & White farm house and into the full color wonderland of Oz (the original Wizard of Oz). Not far behind is our first glimpse of the dinosaurs in Jurassic Park. Director Steven Spielberg brilliantly focused on the stunned reactions of Dr. Alan Grant (Sam Neill) and Dr. Ellie Attler (Laura Dern). We smiled because we knew their reactions mirrored ours! Now, twenty years later, the film has been re-released with a very effective 3D re-mastering. The movie has its place in Hollywood history for its revolutionary use of George Lucas’ ILM CGI and the animatronics and visual effects under the supervision of Ray Winston. This was no ordinary science fiction special-effects movie. 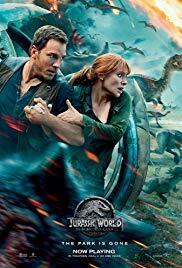 It was a very interesting, entertaining, thrilling story that brought to life the plastic dinosaur toys of kids and dinosaur dreams of curious adults. This was light years from the Ray Harryhausen stop-action dinosaurs we had seen before. The dinosaurs in Jurassic Park had back-stories, childhoods, ferocious roars and a realistic look that tied right into our childhood fantasies. Never-before-seen special effects would be enough to set this one apart, but it’s the story and characters that draw us in and elevate the movie to classic status. 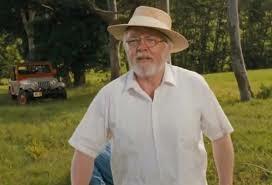 John Hammond is a very likable, little old rich man played by Sir Richard Attenborough. In fact, Attenborough is genuinely such a nice guy, he was cast as Kris Kringle in the 1994 re-make of Miracle on 34th Street. He is also an Oscar winning director for Gandhi (1982) and ironically beat out Spielberg (E.T. the Extra-Terrestrial) that year. Attenborough also directed A Bridge Too Far (1973), A Chorus Line (1985) and Chaplin (1992); plus, one of my favorite hidden gems: Magic (1978). Unfortunately, Attenborough, now almost 90 years old, has recently been moved into hospice for health reasons. John Hammond and his team of scientists have taken “dino DNA” and brought life to dinosaurs, previously 65 million years extinct. Hammonds’ instincts as a showman lead him to develop a kind of amusement park where people can come and see his dinosaur creations in a natural habitat. Facing a lawsuit … what could go wrong?? … his investors bring in a team of specialists to inspect the park. Dr. Grant, Dr. Attler and Dr. Ian Malcolm (Jeff Goldblum) take the tour with Hammond’s grandchildren (Joseph Mazzello and Ariana Richards) and a bean counter played by Martin Ferrero. Of course, things go terribly wrong thanks to a sub-plot involving the park’s computer guru played by Wayne Knight (Newman from “Seinfeld”). Don’t miss the photo of J Robert Oppenheimer (the atomic bomb creator) on Nedry’s computer monitor. Samuel L Jackson has a classic line of dialogue, but also seems to be prepping for his role in Deep Blue Sea (1999). The other key player is the park’s game warden played terrifically by the late Bob Peck … he mutters the “clever girl” line. Real life Paleontoligist Jack Horner worked as an adviser on the film and was the inspiration for the Dr. Grant character. It’s also interesting to note that there was quite a bidding war for the rights …even before writer Michael Crichton had finished the manuscript. When Spielberg won the rights, he hired Crichton to write the screenplay, and David Koepp was brought in for the final version. Crichton is also known for Westworld (1973), Twister (1996) and The Andromeda Strain (1971). Mr. Koepp is known for his screenplays that include Mission Impossible (1996), Panic Room (2002) and Spider-Man (2002). And of course, the majestic score was composed by the great John Williams, a frequent Spielberg collaborator. 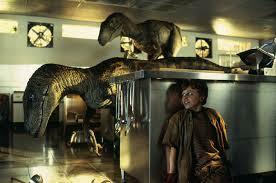 Jurassic Park was nominated for and won three Oscars: Best Sound Effects Editing, Best Visual Effects and Best Sound. 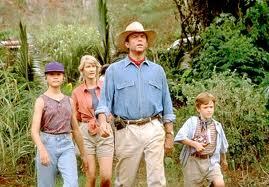 Many believe Jurassic Park should have nominated for the Best Picture, but I doubt Mr. Spielberg much cares. See, he released another movie that same year… Schindler’s List … which did win the Best Picture Oscar. Many ask about the child actors from Jurassic Park. Tim was played by Joseph Mazzello, who was most recently seen in TV’s “Justified”, as the snake-charming traveling preacher. Mr. Mazzello has also appeared in The Social Network, and the mini-series “The Pacific”. Lex was played by Ariana Richards and she won the role based on her amazing ability to show and express fear … and her believability as a teenage hacker. Ms. Richards has focused more on her work as an artist, but does act periodically. Jurassic Park is definitely one to experience on the biggest screen possible with the clearest sound possible. This 3D re-mastering is worth the price of admission and I enjoyed seeing the look of awe in the eyes of a few youngsters in the theatre. No need to wait for Jurassic Park 4, which is scheduled for release in 2014 … go experience the original in its full big screen glory! 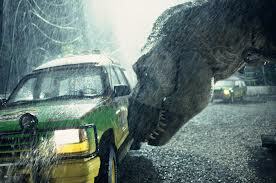 **NOTE: It’s always fun to see kids experience the Jurassic Park dinosaurs for the first time, but I like to warn parents that there are two very intense, terrifying sequences: the first T-Rex attack in the rain, and the kitchen scene with the Raptors chasing the kids. Young kids need to be pretty tough to make it through those scenes.